Nymphing should be easy. At least that is what the fly fishing world seems to hint. I think it is true... that is once you "get it." However, it can be a definite struggle to "get it." It was for me at any rate. When I first began nymphing my abilities were quite dismal. I'm no pro, and Shane can outnymph me any day, (though I would dare to say he could outnymph anyone) but I am much better now than I was at the beginning. Here are a couple lessons learned the hard way, and some simple tips. Depth Is Key. This I think is the biggest factor to understand when nymphing. If you aren't right on or near the bottom, you won't be in the zone. I had a tendency to fish either too shallow or too deep. Nymphs naturally roll along the bottom of the water column, bouncing in and out of the cracks between rocks. Sometimes fish pick the stationary bugs up off the bottom, but more often they take them as they drift downstream. To get into the zone, the proper weight and leader/tippet length is essential. Water current lifts line, and keeps it suspended more than most people think. Too little weight and you will occasionally get an aggressive fish, but will miss far more chances than are possible. Too much weight and you will constantly catch the bottom, keeping you from getting an effective and consistent drift. Also, if your leader/tippet to indicator distance is too much, fish will be taking your fly and you won't have a clue. One of the best ways to tell if you are in the zone is to watch your indicator. If you can see it occasionally bump the bottom or drop down, you are in a good place. The key word here is "occasionally." If after multiple casts it doesn't do anything, you need to be deeper. Either add a little more weight, or move your indicator up the leader. Knowing which thing to do in which circumstances takes practice and experience, but they both have their places. When in doubt reevaluate the water depth and add weight or length to your leader in very small increments. The second way to tell if you are getting in the zone is if you are catching fish. More often than not, you will catch fish, if you are getting in the zone, even if you aren't using the most effective fly. If your indicator tanks on every cast you are too deep or have too much weight. The more vertically your flies present, the more sensitive your indicator will be when a take occurs (think of a 90 degree angle with your indicator as the vertex). Learn To Read An Indicator. The second biggest struggle when improving your nymphing is knowing how to read what your indicator is doing. This is much easier, once you get the idea of proper depth down because you will be setting less and hooking more. The two main actions I see when using an indicator are a slow lazy sinking motion and an abrupt diving motion. You can guess which is more likely to be a fish, however either can be a take. Setting on everything is a good practice, but if you make multiple casts in a run and know right where that rock is that keeps taking the indicator down, you can give a light tug to keep it going while in the zone. That may get you into the fish behind the rock that you would have missed with a full set taking you out of the zone. Sometimes fish are suspended and feeding higher in the water column but this is more the exception than the rule. These times are fun because you know when your indicator tanks it is always a fish. Sometimes fishing shallow is the only way to avoid losing multiple flies, but you will almost always catch more fish when you go deeper. Watch out for line drag. It will always fool with your indicator and pull your flies away from the zone. The longer you maintain a drag-free drift, the more likely your are to get a hookup. If you have to mend (which is almost always essential) make it quick and do it right the first time. Balloon Indicators Are Sensitive. Using a small water balloon for an indicator is nothing new to the fly fishing world, but I thought re-mentioning its benefit wouldn't hurt. If you keep missing fish, or are fairly certain you are in the zone but aren't recognizing bites, you might give this method a try. You can see even the slightest bumps when using them, just try it and you will see. One disadvantage to using them is that the method kinks up your leader pretty bad. They can also pop if you have weak balloons. Despite these potential cons, they can be a great go to when the fishing is tough due to a light bite. Weight Types And Placement. 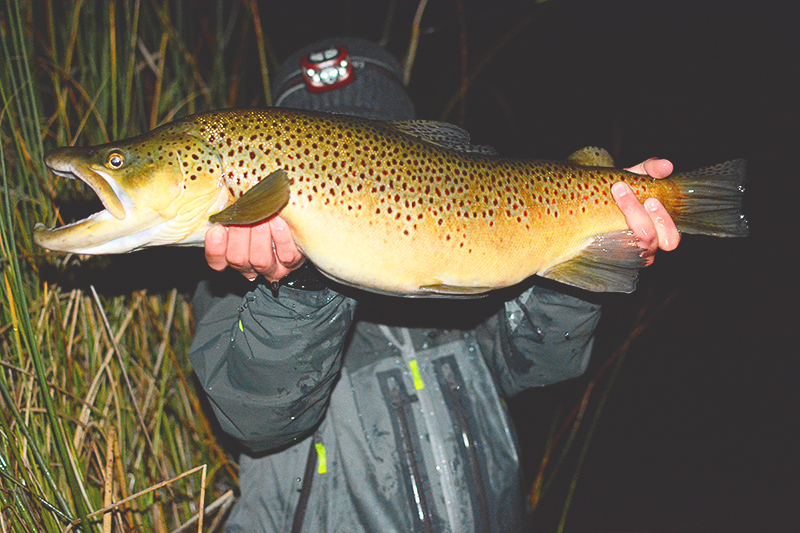 When fishing faster water, getting down deep requires weight. Some guys prefer to put it into the fly, others prefer to use shot. I do both. When using a rubber-legs (or any other largeish imitation) I usually tie the weight into the fly. When fishing smaller bugs, I often use shot. 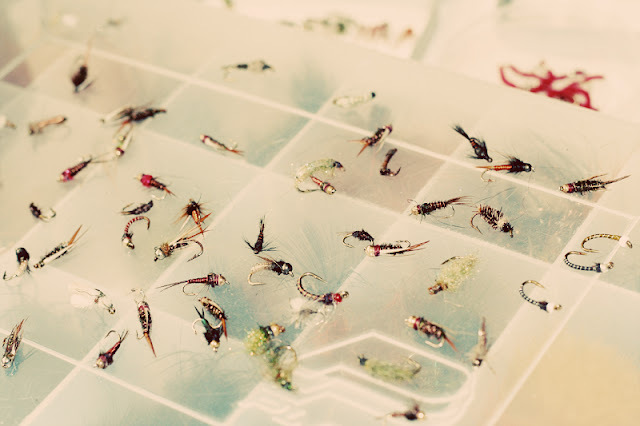 Tungsten is an excellent way to get weight into smaller flies as well, just a bit more pricey. When using shot, there are different ways to fish it. Some put it above the lead fly. Others place it between their lead and trailer flies. When using an indicator I usually opt for the in-between flies approach. However, when high-sticking or swinging I prefer to attach a very light section of tippet to the trailer fly, tie a simple overhand knot in the end and put a shot just above the knot. I find I get fewer snags with this approach, and when I do get snagged it is usually on the shot. It breaks free, I tie a new knot and add another shot. If you are fishing a pretty "snaggy" run with an indicator, but still need to get down, this method can also be effective. Another thing to note is that multiple smaller pieces of shot will give you less snags than one larger shot will. Ultimately the "feel" that is so essential in fly fishing comes through experience, so get out there and try something new.